Through the years, we have had the opportunity to work on almost every Porsche model. We truly believe that our specialty is working with the owners. Our mission is to offer excellent service while staying true to our customers and the Porsche brand. Let us help write your car's story. Our competitive prices and friendly staff set us apart from any dealership experience. Whether your vehicle needs an oil change, tires, or major mechanical, we will accommodate all of your service needs. We specialize in complete engine overhauls for air cooled 911's 1965-1998. In addition we have many years of experience building the water cooled engines from 996/997 Turbo, GT2, and GT3. If you have a Porsche factory racing 996/997 Cup Car we would be happy to discuss overhaul, repair, or upgrade from 3.6 to 3.8, 3.8 to 4.0 liter. 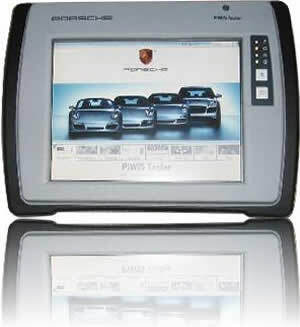 The AUTOLOGIC tool is used to reset warning lights and perform various diagnostic and programming procedures for the latest Porsche models. AUTOLOGIC has performance tuning capability. Can’t get to us? Our flatbed transporter can pick up and deliver your car the most safe and secure way possible.